So after many many many hours in the shed ive put together what i think is a close example of what a bag of arrows may have looked like at crecy, poitiers and agincourt. This is of course only my interpretation and with thanks to Len for some sound advice im going with it! 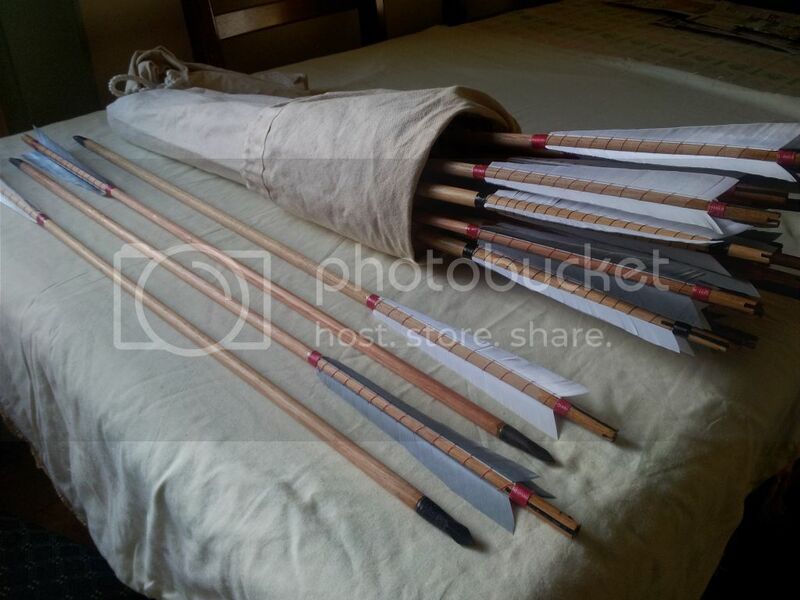 The reason its on the forum is to get fellow archers and warbowers thoughts on my arrow arrangements. 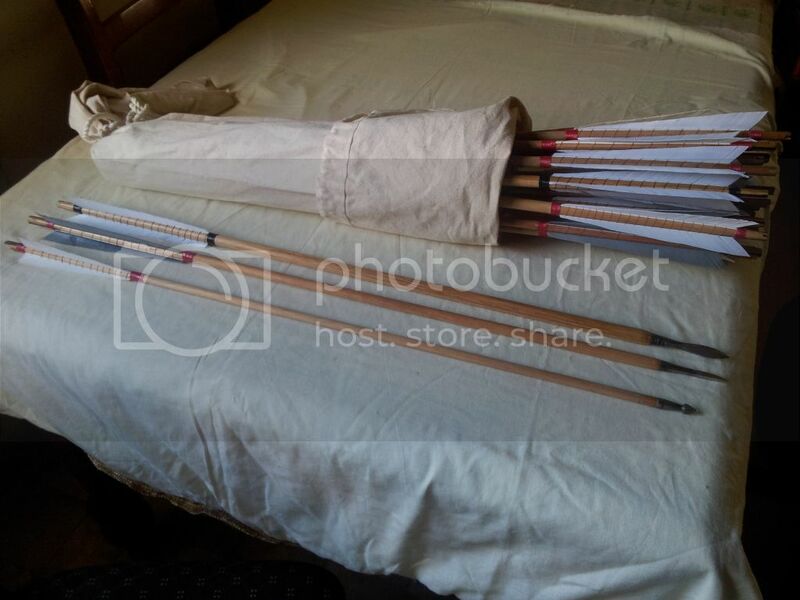 If you found yourself on the field at crecy how would you want your bag of arrows to look? This is what i think would be a good all round bag for a set piece battle like crecy. x3 pricking arrows, made to go over 230 yards. Hardwood but only 3/8 the whole lengh. More a physcological arrow as in "wow, they can hit us from that far!" ends of the fletching are cut square so it goes further and tipped with a simple bodkin. 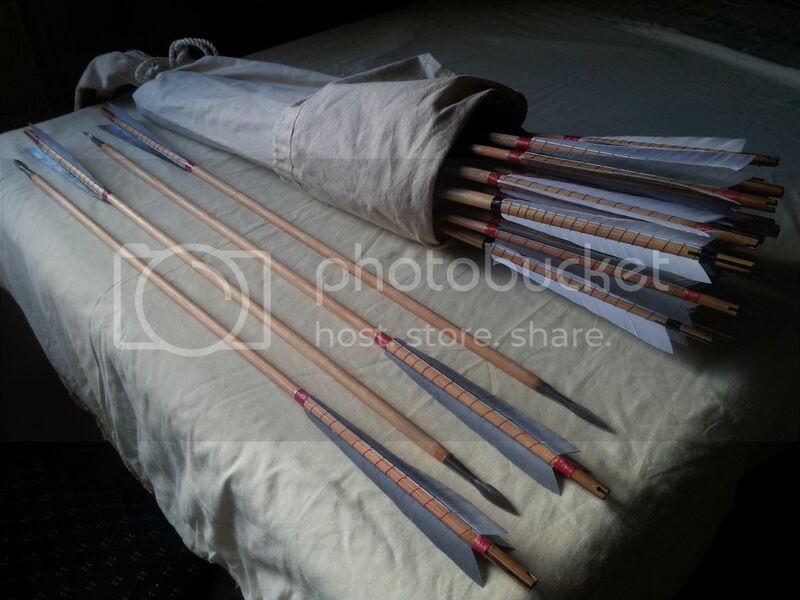 x4 1/2 to 3/8inch hardwood and a little more weight, again like the pricking arrows these are for horses and upsetting the enemy army as it starts marching. 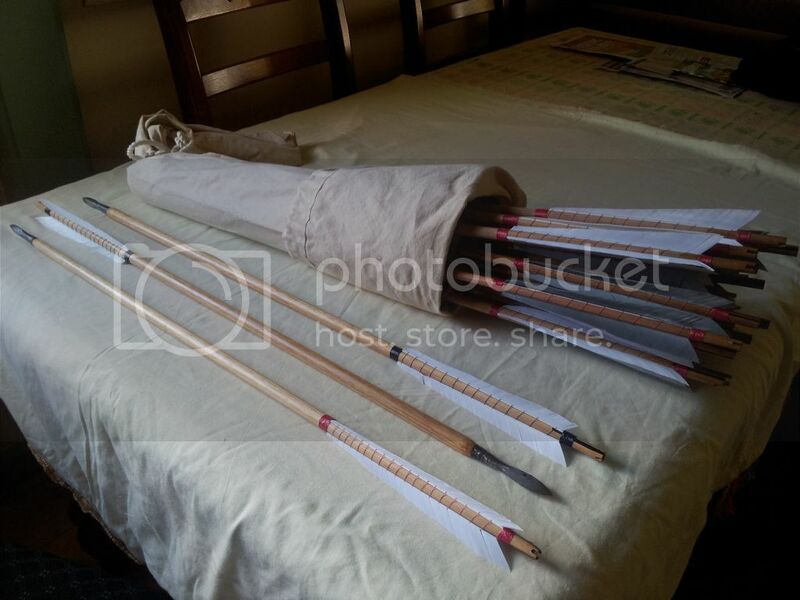 x14 1/2 to 3/8inch hardwood and more weight, these arrows are for 180yards and closer and tipped with war bodkins, these are armour piercing and hit hard. 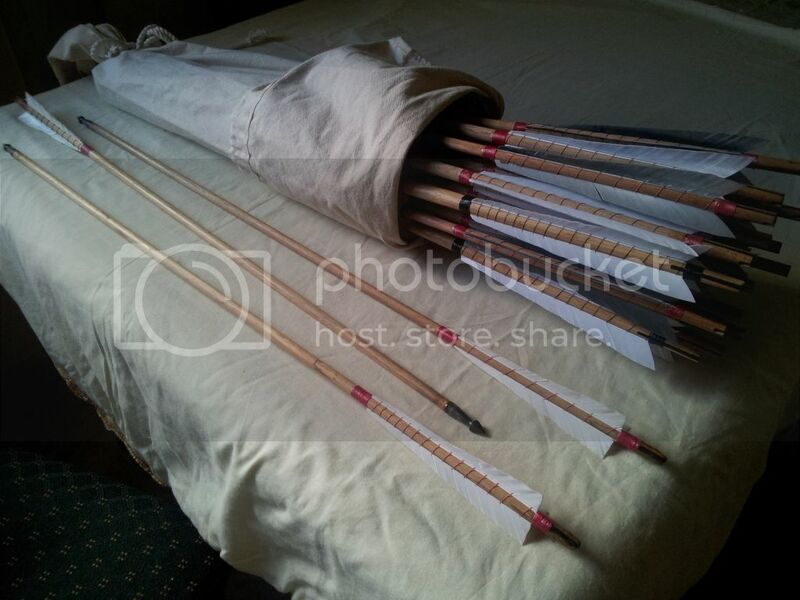 A great standard war arrow. that they are for close range only, as in both armies have met in the field and the hand to hand starts. Just to give some perspective on the long range to the short range. So thats it, an all round bag that has light long distance arrows, normal hard working arrows for med range and of course the 1/4 pounda! If anyone has any comments on how to improve my bag then please lets know. Thanks to hecter Cole and richard for their work on the heads. Great work Rob and I reckon thats how I would want my arrow bag loaded up. That's a good set up Robert but I think you need to add about 60 yards to all the distances to be more historically correct. Quarter pounders are being shot over 200 yards on a regular basis and the current record is 241 yards. Joe Gibbs has put a Standard Arrow 315 yards and averages 280 or so. Last weekend he put a Livery Arrow 296 yards without any wind assistance. Yep. your spot on with those numbers kieth. Only im shooting #90 2 #110.so ive based my bag of arrows on that. as far as shooting a 1/4 pounda over 200 yards go, why would you? Even if i was in your league and shooting over #120 +would i realy want to shoot a 1/4 pounda that far? Is not that arrow (design) made for the close range. I was thinking its for the close work when u can tell who you are shooting at. is the 1/4 pounda not best used up close? i wonder how many 1/4 pounda's were in the standard arrow bag at crecy? A quarter pounder is designed to defeat plate armour. Remember an arrow still has good penetrative powers at extreme range due to parabolic curves, terminal velocity etc. Personally I'd be not wanting to let anyone too close so I'd be shooting the arrows as far as I could. Being walloped by a 1/4lber at 240 yards would be a sobering experience. Now I don't know if there were lozenge style heads at Crecy, I think they're later in the 100 yrs war but a 25g head has been found there. We use a replica of that on our Sheaf Arrow. That head combined with an ash shaft weighs around 85g so although its a bit lighter than a 1/4lber it's still a decent heavy weight. Me and Aaron have now put them over 220 yards and I'm sure Joe would be able to put another 40 or 50 on that. Robert Hardy believes arrows of that weight could be shot those sorts of distances. There's such a variety of heads and I've no idea how they were issued to the archers, but my guess is that a Type 10 was the bog standard head based on it's ease of manufacture and decent penetrating qualities. It could be that other heads/arrows were special issue. It's pretty much a guessing game due to the lack of hard evidence. Well from a 140lb bow it's the same as being hit by a bullet from a .357 magnum so a 130lber isn't that far behind. Aaron has put 1/4lbers through two 1mm mild steel plates placed against each other from a 135lber.